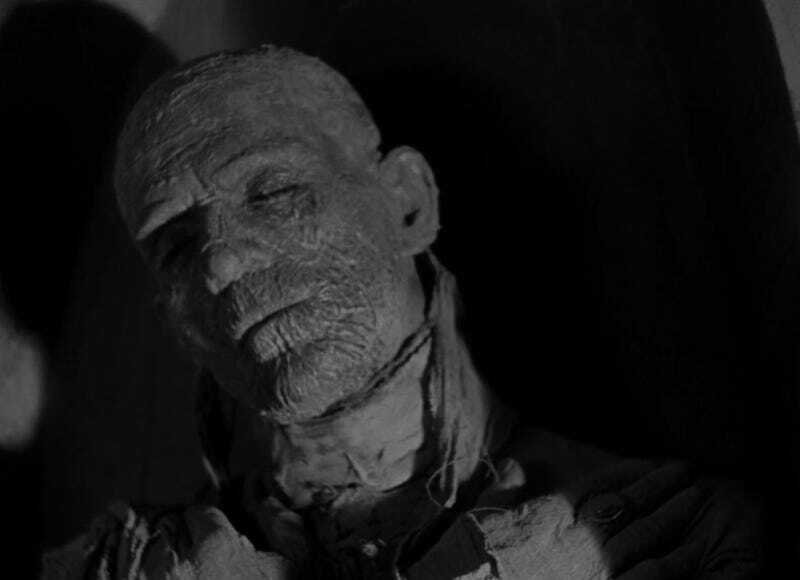 The 1932 version of The Mummy starring Boris Karloff is one of the greatest horror movies ever made, right up there with the 1930s versions of Dracula and Frankenstein. And now an extremely rare movie poster for The Mummy could become the most expensive in the world after it goes up for auction starting today and running through Halloween. Sotheby’s expects the poster to fetch anywhere from $1 million to as much as $1.5 million. Just three original posters for The Mummy are believed to still exist. The other two are in the hands of private collectors, including one that’s owned by Metallica guitarist Kirk Hammett. Designed by Karoly Grosz, the advertising art director for Universal in the 1930s, the brightly colored piece broke new ground for movie marketing at the time with its minimal use of white space. As Sotheby’s notes, the poster was never made available to the public and was only used by theaters for promotional purposes. The poster for The Mummy last sold at auction for $453,500 in 1997. It was the most expensive movie poster ever sold and held that title until 2014. The movies of the 1930s provided great escapism for people struggling through the Great Depression. Sometimes it was the musicals of Busby Berkeley in films like Footlight Parade and Gold Diggers of 1933. But other times it was the creepy crawly movies of Boris Karloff like The Mummy that helped take the nation’s mind off of soaring unemployment and crippling poverty. “Universal’s series that included Dracula, Frankenstein, and a werewolf were great diversions,” Dennis Perry, associate professor at BYU and contributor to the book Recovering 1940 Horror told Gizmodo by email. The auction for the 1932 poster was originally scheduled to start this Saturday but Sotheby’s decided to move the date up to today. It’s an online-only auction, so if you have a spare million lying around, you can get in on the action from anywhere in the world. The auction ends on Halloween, Wednesday, October 31st. It’s been quite a year for movie poster nerds. First we saw the oldest movie poster ever go up for auction in the UK. And now this movie poster is expected to become the most expensive ever sold. The poster for The Mummy will be on display at Sotheby’s New York from October 14th until the 18th. If you’re in the area you can check it out. Was This The First In-Flight Movie?